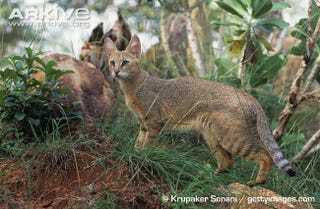 The Jungle Cat (Felis chaus) is a medium-sized cat that can be found in many parts of Asia. Its size and appearance has also earned it the name jungle lynx, but it is not a member of the Lynx genus. It is, however, the largest extant member of the Felis genus. They range in size depending on their environment, but they can grow up to 37 inches (94 cm) in body length with a short 12-inch (31 cm) tail. They can weigh as much as 35 pounds (16 Kg). The diet of a Jungle Cat varies depending on its habitat, but they tend to hunt small animals like rodents, birds, reptiles, amphibians and hares. If they live near human settlements, then they will also take small livestock like chickens and ducks. They are ambush hunters, stalking their prey in tall grasses, getting as close as they can before pouncing. Jungle Cats compete with jackals and forest cats for their prey, and they are also preyed upon by larger felines like tigers, and also wolves, crocodiles, and bears. Female Jungle Cats will give birth to a litter of one to five kittens, but the average litter size is three. The gestation period lasts for 63 days, and expectant mothers will find abandoned dens so that they can be safe while they have their kittens. In the wild, male Jungle Cats are not involved in rearing their kittens, but in captivity they have been observed to be extremely protective of their offspring - more than other species of cats. The Jungle Cat is listed as Least Concern by the IUCN because their overall population is healthy - however, specific populations of Jungle Cats are under threat in the Caucasus and other areas.